1st London show in 2 years. NEECH IS BACK!!!! LIVE! ON MONDAY 23rd JANUARY! After 2 years swanning about on the other side of the channel Neech has returned to the UK! This is the 1st London gig in all that time, and we’re easing ourselves in with a gentle, start of the week, early doors, acoustic show (just me on vocals and Oli on geetar), featuring some new songs, and perhaps a couple of old ones for you to singalong to. It would be SO BLOOMIN’ LOVELY to see you there. You know the Monto Water Rats venue near Kings Cross, right? Well it’s there. We’re onstage at 7.30pm… so come straight from work innit! And there are 3 other bands on after too (The Marauderz, Bite The Buffalo and Heads Heart) so you can get your boogie bones warmed up for the week if you so desire. It’s usually £8 on the door, but you know how we loves you, so if you click attending on the Facebook event or send me your names we’ll stick you on our £4 list. How delightful. 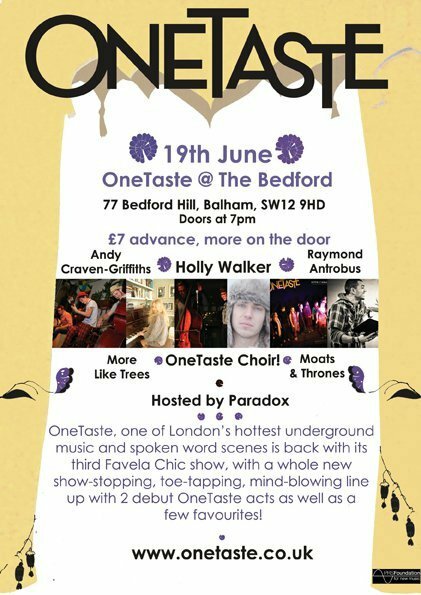 £4 for live music in London! That’s more value than you get your tube fare! So I’ve been away a while, but I have been busy. And as a writer, lover of lists, resolutions and talking, it was only a matter of time before I got to the ‘must write blog’ section of my resolutions. The second half of 2011 was pretty damn good Despite the fact that I didn’t feel like I was making much of my own music. But looking back, that’s wrong. Yes I was singing beautiful harmonies with others, especially The OneTaste Choir (including backing vocals for one fabulous Miss Alice Russell) and performing/ recording with the Dancefloor Outlaws and Profit (of course). I was also, slowly but surely, writing a whole load of new Neech material with the wonderful Monsieur Oli Thompson. Hopefully you will get to hear the new material soon, but for those of you who can’t wait, I have uploaded a couple of bits of work in progress (remember that!) onto Soundcloud. The first is ManCloud which is currently midway through being produced by Paris’ finest, Borrina Mapaka (Longo). Oli and I recorded guitar and vocals back in September 2011, and left the rest up to Borrina and the boys. Production is temporarily halted as a massive studio move is underway but you can hear the direction it’s headed. The second track I’m sharing with you at this early stage is called Is It?. This is a recording we made just after we had finished writing the bare bones of it, mainly so we could remember it. Personally I still really like it. I’d be interested to know your thoughts… but be gentle. I am still a sensitive artiste. I’ll be back soon with more, but I’m signing off for now as today is a very big day for me. More on that soon. What a lovely sing songy time this is turning out to be. But what’s really lovely, is taking the time to go and sing with other singers. Since then I’ve been in and run other smaller choirs and singing groups. But one in particular caught my attention. The OneTaste choir, run by the lovely Stac. Having followed their events from afar while in Paris, I finally got the chance to go and be part of the OneTaste choir. And what a treat. Even just the harmonic warm up session filled me with with a warm tingly glow (or maybe that was the ants on the hall floor crawling on me while my eyes were shut?) Not only am I back in London, but I am BACK in the loveliness of a beautiful sounding singing group. I hope this is a love affair that can go on and on for aaaages. So I’m back in London again. It’s lovely to be back home. Exhausting, but lovely. A good friend and music maker, Gumnaam, from Netherlands, has been in and out of London a lot lately. Having tracks regularly played on Nihal’s Radio 1 show and his vinyl releases on sale around London. Gumnaam is one of those fabulously hard working artists. We met through a mutual friend in Amsterdam, and I performed at one of his nights. We wound up in his Haarlem studio together, me jamming over his beats and us all generally having a lovely time. I left him with some of my music, in particular some acoustic parts that me and OIi had laid down. Over the last couple of years I’ve known him he has sent me various remixes of my songs as well as tunes he’s made out of our jam session and also new beats for me to work on. Luckily for me he’s been about this week too so I took the chance to catch up with him last night. Sat like proper tourists sipping a vodka at the beautiful Thameshead pub looking out over the river, watching the sky darken. I love this part of London. I’ve always made a point of driving over London Bridge at night if I happen to find myself in my car returning from anywhere South London of an evening. Ah its nice to be home. So we chatted about recent work he’s done. He’s currently releasing an EP featuring a track I’m on. And he also sent me 3 remixes of my album/ acoustic tracks a couple of weeks back which he wants to release as a remix EP for me. Brilliant. (I’ll keep you informed, reader/listener!) I wasn’t the most creative of people in Paris. I concentrated more on promoting others via BalconyTV Paris than making my music, so it fabulous to have someone else creating for you. During our evening I got a call from my one of my best boys’, long time collaborator and favourite MC, Profit. He and Gumnaam hadn’t seen each other for about 2 years so it was lovely to hear them gas about DJs and MCs they both know and respect. Plus Profit’s album is close to completion and, fingers crossed, release. That, my dears, with be a must-buy item, I warn you now. So watching my city light up at night, and listening to the guys wax lyrical (see what I did there?!) about their projects, I could sense a little warm glow inside… being around my people who want to make music and want me to create too… I’m so happy to be getting my music head back on. B is for lots of things that apply to this week… Being Busy, Boozing (Royal Wedding fun! ), Breaking things, Beat gathering, Bloody heavy Bags Being dragged onto the Eurostar to Bring me Back home to London! 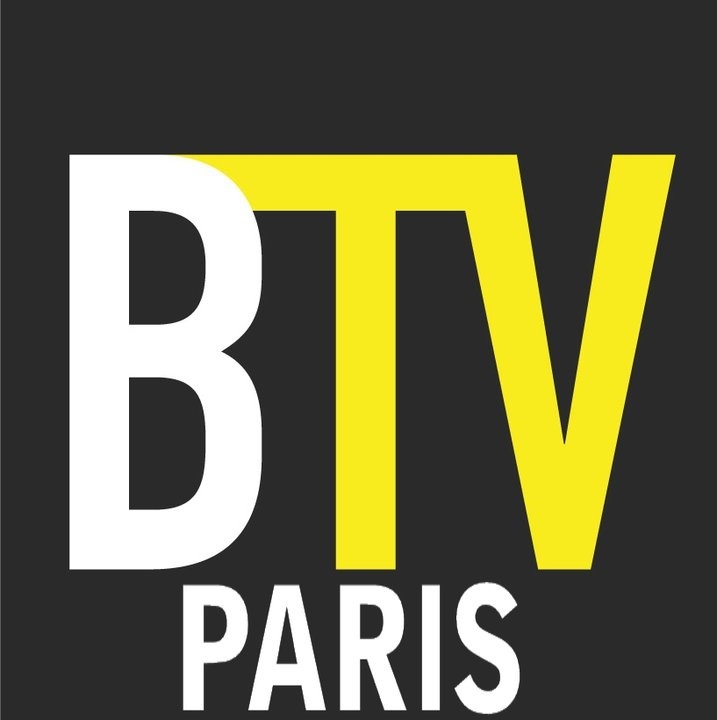 But also, B is for BalconyTV, specifically BalconyTV Paris. The online music show that I produce and present from a Balcony in Paris, with the assistance of co-producer, camara and sound man extraordinaire, Léo. It’s a lot of work, we meet a lot of musicians, from very different scenes, from all over France and the world. There are BalconyTV shows being produced from cities including New York, London, Poznan, Hamburg, Mexico City, Auckland and many more now. But we started the Paris one almost a year ago, and all for the love of music. So when my ever handsome and extrememly talented guitarist Oli came for a weekend visit to Paris, which just so happened to coincide with a BTV shoot, well, there was only one thing for it really. Rope him in to collect authorisation signatures and then… record a show featuring Neech. It’s actually quite nerve-wracking to perform on the balcony, sans mic, in front of all the groups you’ve just been inviewing! Thats all I can say for why I look so moody! No excuses for Oli though, he’s just cool. My Hair Is Not Who I think It Is. It never has been. Most mornings we have to have harsh words with each other about how we are going to behave today. In general, she always wins. I can twist and tussle, pull and squeeze but my hair pretty much always goes her own way. It took me a long time to realise this but it does make life easier. 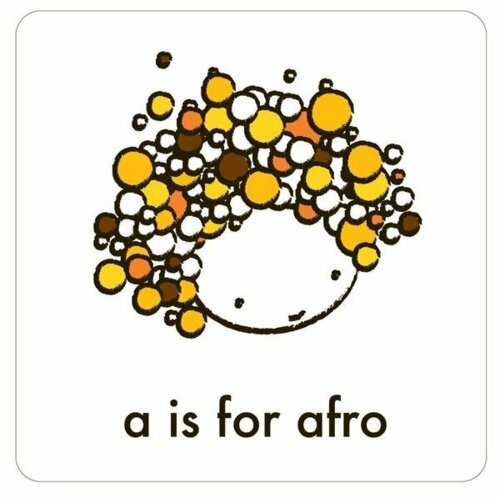 I have of course tried various perms and straighteners to try to get it to be flowing and moveable like mum’s, but I must acknowledge that I also have African roots, and predominantly that means AFRO hair. I am in no way complaining. I grew it, I love it. 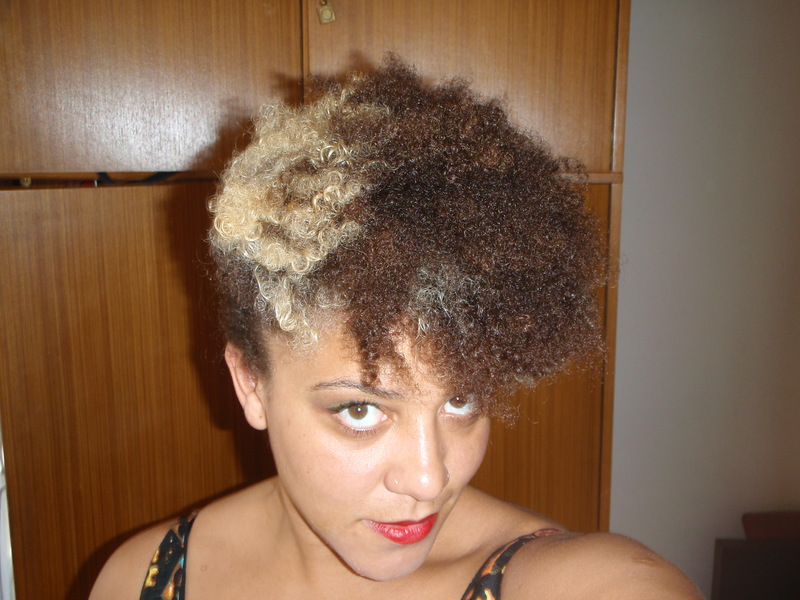 The last time I had relaxed hair I wound up feeling pretty dull and boring. I missed my morning battles and the thrill of seeing what she was going to do. She was weak and flat, and looked like everyone else in the office, so to speak. And as Jill Scott says, Everything ain’t for Everybody. So we outgrew that and got back to enjoying ourselves. We love plaits and twists. And the interesting texture you get when you take them out. We can comb out for a bit of frizz, and some 70s style, or we can wash and go to keep the ringlety fuzz. And you don’t get no Afro puffs with straight hair. Occasionally we experiment with extensions – mostly during winter to keep our ears warm. We love a bit a colour, especially a flash of blonde. We know it’s not good for us but where’s the fun in that?! But there is one reeeeeallly frustrating thing. My hair will not grow up. Or down. Or out. I swear, apart from trims, I haven’t cut my hair since I was about 13. Where are the long flowing Neneh Cherry locks I always thought I would one day wake up to? (Not that I’m wishing away what I’ve got, as I said, I love it. We’ve been through a lot together.) I don’t know if it just gets curlier, or, more likely, breaks of and flies away… But I don’t even bleach it all… anymore. So I’ve decided to go the other way. We are getting a chop. Simply because The Afro and I have hair envy. We were both enjoying a nice day out in the Parc des Buttes Chaumont, frizzing out in the sunshine, when along came a group of young, showoffy dance kids. One of them started prancing about in front of us, and while pretending not to notice her we secretly could not take our eyes off her floppy, curly, short-back-and-sides-but-long-curly-on-top-and-front hair do. Surely I can work out how to do this to my hair as it is? Achievable, but could be very “nesty” if I can’t be bothered to use product. Not too far off my current bedhead. Great shape. Shall I just get a weave? I’m pretty sure this is me in a few years. I’m totally cool with that. Which we quite like too. But it only works if we’re both on the same vibe. You may have already seen this, apparently it’s been doing the rounds. It’s my new favourite thing today. Enjoy.